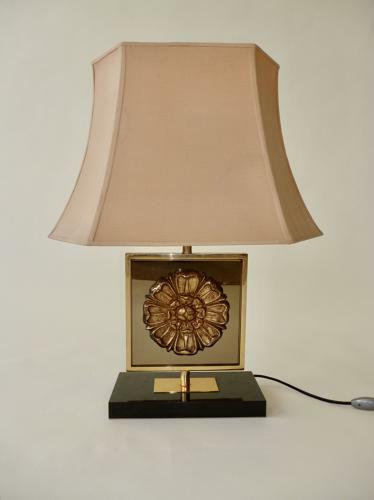 Belgian gilt metal and champagne mirrored glass lamp with a wooden floral motif and black lacquered wood base. The lamp measures 35 cm high to the lampholder. The central square glass /motif measures 22 cm high and wide. The base measures 27 cm by 14 cm. The shade is original cotton and has an apricot /pinky tone.